“I Got You: Prepare to Take Action with Sudden Hospitalization” from Christian Faith Publishing author Sherry Gueary is a comforting work that provides tips on what to consider doing when a loved one goes through an accident and reassures those who take care of accident victims that God is in control of every situation. 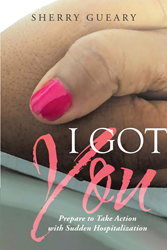 “I Got You: Prepare to Take Action with Sudden Hospitalization”: a captivating book showing how necessary it is for anyone who is suffering from an accident to have someone who is genuinely there. “I Got You: Prepare to Take Action with Sudden Hospitalization” is the creation of published author, Sherry Gueary, a nurse for over twenty-one years. Published by Christian Faith Publishing, Sherry Gueary’s new book is a credible take on being there for a suffering loved one; it is based on her firsthand experience as a mother and a registered nurse on taking care of her son who has survived a motor vehicle accident during Mother’s Day. Gueary also says in this book that accidents make people remember how precious their loved ones are, and that they sometimes have to go through tragedies beyond their control to make them stronger and more faithful. View a synopsis of “I Got You: Prepare to Take Action with Sudden Hospitalization” on YouTube. Consumers can purchase“I Got You: Prepare to Take Action with Sudden Hospitalization” at traditional brick & mortar bookstores, or online at Amazon.com, Apple iTunes store, Kobo or Barnes and Noble. For additional information or inquiries about “I Got You: Prepare to Take Action with Sudden Hospitalization”, contact the Christian Faith Publishing media department at 866-554-0919.